LiveShot leverages the success of Comrex ACCESS audio IP codecs and uses the same technology to smooth out the "bumps" on the public Internet to allow broadcast-quality live video streaming. Comrex LiveShot is especially optimized to perform well on challenging IP networks like 3G, 4G and satellite-based links. LiveShot encodes and decodes video to the H.264 codec standard, which is the state-of-the art codec for high quality video using low network bandwidth. But not all H.264 encoders are alike. Within the standard, several lesser-quality profiles are available to conserve processing power. For optimal video quality, LiveShot encodes with H.264 HIGH profile. Several other options within the H.264 standard, many of which are not implemented by competing products due to complexity, are default in LiveShot. All H.264 options that maximize quality over poor networks and decrease latency are implemented. Comrex has years of experience encoding live, low latency audio over IP networks for broadcast, and LiveShot shows it. In addition to standard AAC audio coding, LiveShot utilizes HE-AAC and AAC-ELD audio coding, both reducing network bandwidth and lowering delay. LiveShot can encode and decode an audio/video stream with less than 200mS delay. Delay may be higher based on encoding mode and network factors. LiveShot uses an automatic decoder buffer manager to keep delay to an absolute minimum. This technology was perfected over years of experience with the BRIC series of audio codecs. 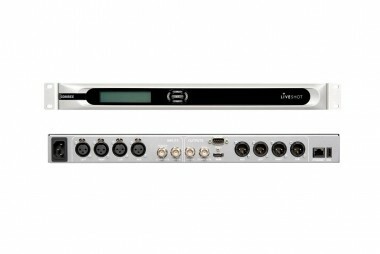 LiveShot delivers full-duplex video and stereo audio between the field portable and studio rackmount systems. In addition, a full-duplex cue channel is available between the systems. LiveShot can be "driven" from the studio via the "LiveShot Central" Server, which is maintained by Comrex. LiveShot Central allows you to connect to your LiveShot in the field from any web browser, regardless of whether the system has a public or private IP connection. Once logged in, the studio side users can set up and operate LiveShot remotely, including the Store and Forward functions. LiveShot can also be controlled locally via a web page delivered from its internal Wi-Fi access point. This Wi-Fi connection is independent from any media channel, and serves a web page optimized for mobile browsers. Besides connection to Ethernet, LiveShot offers connection to wireless modems via two USB ports. These ports can be used simultaneously to increase the bandwidth of wireless connections. LiveShot USB connections are made via a pair of flexible 8-inch gooseneck-style adapters, which serve to elevate wireless modems above the body of the unit and above the cameraman's head. The adapters are bendable to provide for proper physical spacing between wireless modems, and to survive hitting doorways and other obstructions. LiveShot is supplied with a high-gain Wi-Fi USB adapter, and can support a wide range of 3G and 4G USB modems. Via the built-in Ethernet port, connections can be made to Inmarsat satellite terminals.